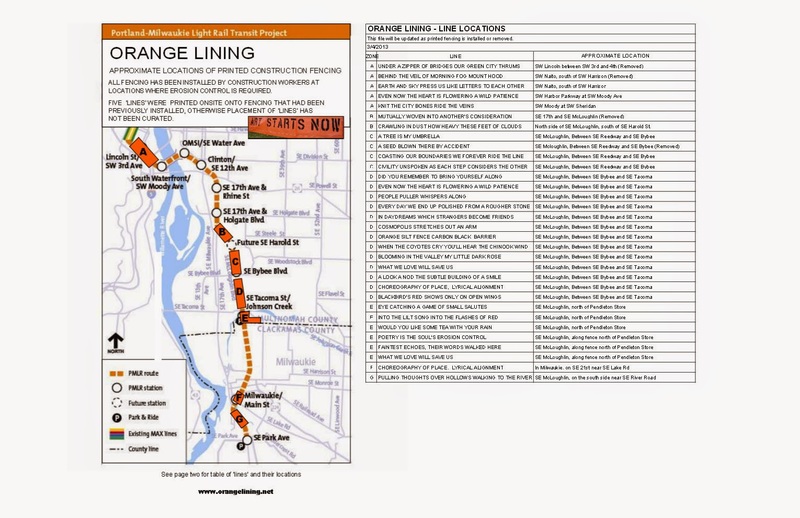 ORANGE LINING: Orange Lining Guide to ‘Line’ Locations. Orange Lining Guide to ‘Line’ Locations. About thirty ‘lines’ printed on silt fencing have been installed so far, five on the west side of the river and the rest on the east side. We hope to see more installed over time: it will all depend on if and where erosion control is needed during the construction process. We just put together a general guide of locations so you can see where to find ‘orange lines’. We’ll update this as fencing is installed or removed. This file was updated on 3/4/13. Blog posts are written by Peg Butler. Photographs have been taken by Peg, unless otherwise noted.